A SpaceX Falcon 9 rocket disintegrated shortly after launching from Cape Canaveral Air Force Station in Florida on June 28, 2015. SpaceX has traced the failure to a faulty strut on the rocket's second stage, CEO Elon Musk said on July 20. 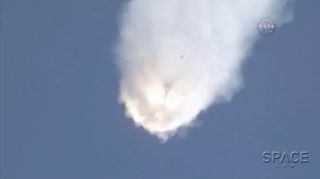 The disintegration of a SpaceX Falcon 9 rocket shortly after it launched on a space station resupply mission for NASA last month was most likely caused by a faulty strut inside the booster's upper stage, company CEO and founder Elon Musk said Monday (July 20). The roughly 2-foot-long (0.6 meters) struts hold these bottles in place. Each strut is certified to withstand about 10,000 lbs. (4,500 kilograms) of force. Based on when the explosion happened — less than 3 minutes after liftoff — the strut in question apparently broke under a load of less than 2,000 lbs. (900 kg), Musk said. "It's not something that should have ever failed at this force level," he said. The strut "would appear to be incorrectly made, but there was no visible way of telling that from the outside." This assessment of the Falcon 9 rocket failure is preliminary rather than definitive, Musk said, stressing that the investigation of the mishap is ongoing. Still, he added, "right now, there doesn't seem to be any other explanation that could make sense." The Falcon 9 launched from Florida's Cape Canaveral Air Force Station on June 28 carrying SpaceX's robotic Dragon space capsule on the company's seventh contracted cargo mission to the space station. SpaceX holds a $1.6 billion NASA deal to make at least 12 such flights; the first six missions had all been completely successful. The explosion did not destroy Dragon, and the capsule continued sending data back to mission control until it disappeared over the horizon, Musk said. The company has retrieved some pieces of floating Dragon debris from the Atlantic Ocean, but most of the capsule is apparently sitting on the seafloor. SpaceX aims to send a robotic submarine to the presumed crash site soon in an attempt to locate the spacecraft. "That is probably the saddest thing about this, is that, if there was just a bit of different software, Dragon would have made it," Musk said, adding that such software will be installed in time for the next cargo mission. However, when that next flight will take place is unclear at the moment. The next SpaceX launch will come no earlier than September, Musk said, and he's not sure what the payload will be when the company returns to flight. The delay and decrease in flight rate resulting from the mishap will probably end up costing SpaceX hundreds of millions of dollars, Musk added. In addition, the ongoing focus on the Falcon 9 will likely push the highly anticipated first flight of the company's huge Falcon Heavy booster into spring 2016 at the earliest. The June 28 Falcon 9 explosion was the third failure of a robotic cargo mission to the space station in less than a year. In October 2014, Orbital ATK's Antares rocket blew up seconds after lifting off, ending the company's third resupply run for NASA under a $1.9 billion deal. And in May, Russia's Progress 59 spacecraft fell back to Earth without reaching the space station, victimized by a problem with the third stage of its Soyuz rocket. "Each one of these failure modes has been quite different," Elon Musk said. "It just goes to show — rockets are a fundamentally difficult thing."